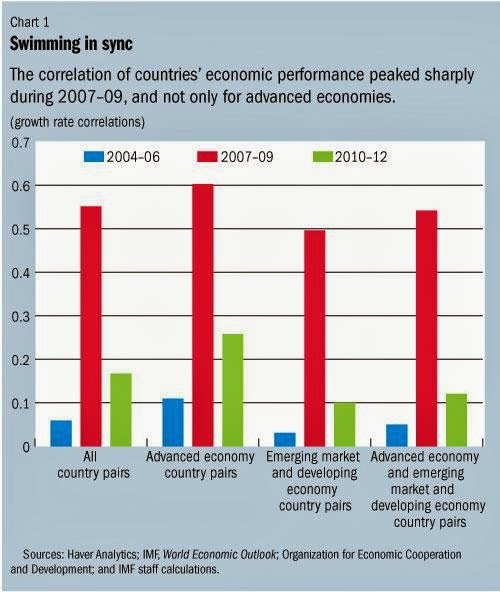 Latest IMF research shows the strong correlation across all economies during the financial crisis or Great Recession. Those correlations have come down as we have moved to a more normal environment, but it clearly shows that there is no diversity gain in a crisis. The IMF research goes on to show that if you peg yourself to the dollar, you are asking for trouble if there is a monetary policy shock. There is no shock insulation when there is no float in the exchange rate. If you want to protect against a Fed taper shock, allow for the exchange rate to adjust on its own. It is harvest time and farmers in the US Midwest may not be happy. The harvest will be good for both corn and soybeans, yet it will not be at the price levels seen last year. Corn is down over $1.5 per bushel. Soybeans are at about the same level as a year ago, but there is the consensus that prices will fall further as we move into the harvest. Grain prices are mean reverting. The high prices of last year on bad weather will be reversed on larger planting and better yields this year. This mean reversion is part of the life of being a farmer. Why nervous on long-term grain prices? The success of farmers to feed the world has been based on high productivity for the main grain crops, yet a careful look at the productivity gains in yield shows that the Green Revolution has peaked and there has been a noticeable decline in yield improvement. Some of this has to do with bad weather, but the general trend is down. The success of farming is based on technology and if technology is not doing its part, food prices will continue an upward trend that has been a part of the current super cycle. Perceptions of "Main Street" and "Wall Street"
This picture is the visualization of the divide between Main Street and Wall Street which still exists five years after the financial crisis and four years after the end of the Great Recession. The Wall Streeters have to be controlled because they represent "biker capitalism". No rules for the road. Main Street feels they need protection regardless of whether the threat is real. The image of the finance world has to be changed. The finance industry is vital for the future growth of the US. The financial share of profits in the economy was too large pre-crisis, but it should not be shrunk as a vindictive policy. The monetary church at which we worship as described by Amity Schlaes of Forbes is loose money with no change in sight. 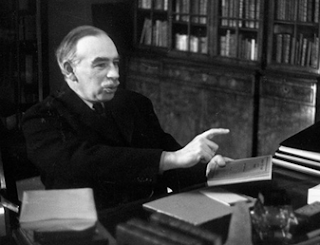 The general consensus or "Bernanke consensus" is there will never be a shortage of liquidity like in the Great Depression, there is a need for inflation because deflation is the real enemy, and the dual maintain requires Keynesian monetary policies especially at zero interest rates. There is talk of tapering but there is little discussion of reversing the huge balance sheet of the Fed. Cutting purchases by the Fed is not the same thing as cutting the stock of securities. Now, the balance sheet will decline with bonds maturing but that is a very long process. There is only one orthodoxy in monetary economics. "... trading growth for the rule of law" -Sam Zell on investing in emerging markets. Sometimes simple phrases sum up how you look at an asset class. For example, being long commodities is also being short technology. The bet is that technology can keep real prices falling in the commodity area. Sam Zell has made a good short phrase which sums-up emerging market investing and in particular emerging market real estate investing. You want to have growth that exceeds the crony capitalism, and red tape associated with most emerging markets. If legal and regulatory problems of emerging markets can be solved, the returns potential is significant. This comment is consistent with the economic development work on structural change and the main topic of the book, Why Nations Fail? Long article on Sam Zell in Forbes Magazine. He is a great value investors whose reputation was hurt by the purchase of the Tribune company. Nevertheless, he provides good advice on investing. Here as some of his simple rules. 3. Structure the deal so that you pay as little as possible in taxes. -Raghuram Rajan New governor of the Reserve Bank of India (RBI) and University of Chicago professor. The dollar has declined from highs in early July. The dollar decline occurred even with the discussion of tapering by the Fed. There was a small rally at the end of August before a further continuation of the downtrend.With no tapering and renewed comments by the Fed that they have to "forcefully" provide stimulus, there are new headwinds against any dollar rise. For the DXY index, the dollar decline is also about the ascent of the EUR. The combination of a better EU growth and concerns about a US recovery provide a mix which is not dollar friendly.The current stability of the yen provides contrast to the dollar rally versus yen earlier in the year. There is no reason not to see year lows before December end. One final slide from the Mike Mauboussin Credit Suisse seminar I attended. Mike discusses the latest research on how executives make decisions. They usually use a single simple analogy or a few cases for making a decision. We can do better at classifying the choices of executives as seen through this simple two by two matrix. 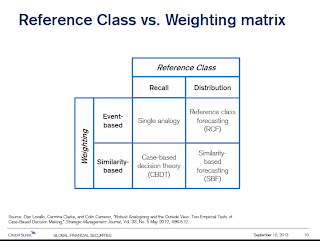 We can think about a reference class and the weighting between those references. If an executive uses a single case for making a decision, then he is having single recall with a weighting that is event based. In this case, the simple single event story helped to make the decision. If there are a few cases, the executive is using similarity based weighting. A set of cases are used to make the decision. However, we can also think of decisions that are based on a distribution of events. The upper left hand corner would be using the law of large numbers to make a decision. Play the odds based on the set of all events. This make sense of you have a lot of information. The lower left hand corner may be the best possible outcome because you use distributional information as well as conditioning to help make decisions. Conditional views on large data sets will give you the bets chance of success and also allows the decision-maker to place some well defined bounds on any decision. 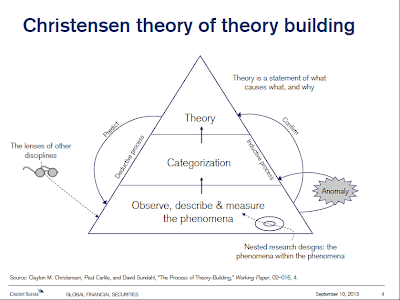 There is a theory of theory building developed by Clayton Christensen that was presented at a recent Credit Suisse seminar by Mike Mauboussin. It is based on a three step process. I think this is a nice framework for thinking about research. The first part is making observation. We see, measure, and describe. We take those observations and start to group or categorize them. There are associations or a look for correlation or clustering of events. 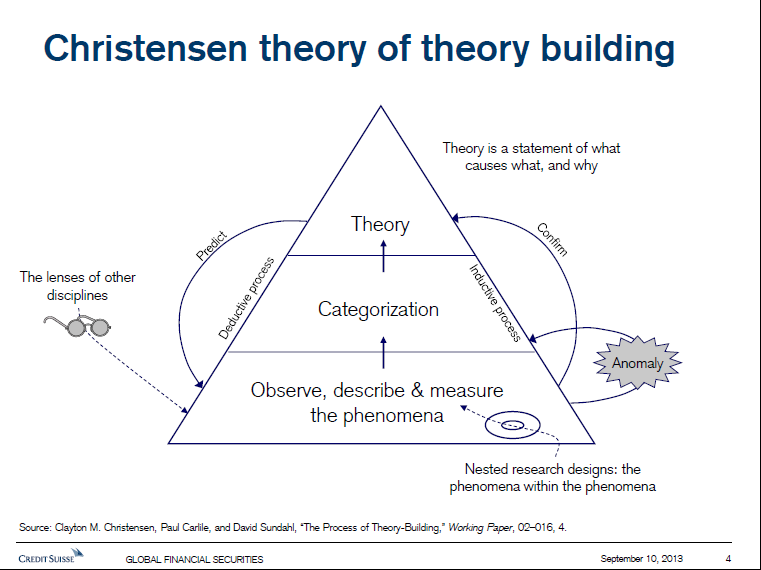 From the skill of categorization we start to form theories that can be tested. We can then look for other linkages and predictions. This process is the scientific method, but there is a stronger emphasis on the middle phase before theory, the process of categorization. We often just sort and do not move to the theory and prediction phase. It is worth thinking about how you go through your research process. Does it match the theory of theories? 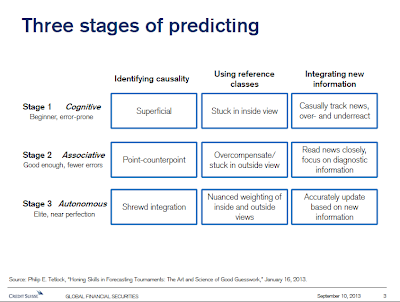 This is from a presentation by Mike Mauboussin of Credit Suisse. The slide was developed from work by Phil Tetlock, the expert on decision-making. I heard this story from a Credit Suisse seminar held by Michael Mauboussin. He is excellent investment thinker who has written a number of provocative books on decision-making. Make time for Mike. 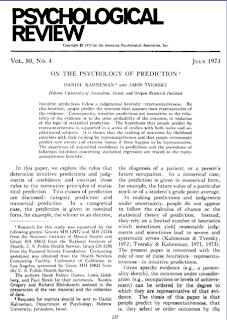 The great behavioral psychologist and Noble Prize Winner in Economics stated that of all the papers that he wrote the one that was his favorite was On the Psychology of Prediction written in 1973. 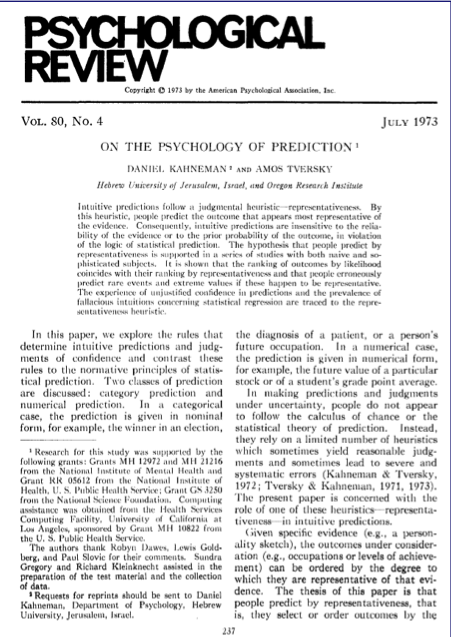 In this work, Kahneman with his co-author Amos Tversky discuss the difference between intuition and statistical prediction. They discuss the problem of representative bias and how there are three types of information for any prediction. There is the base case or outside view, there is the specifics about the particular case or inside view and finally the relative weights you assign to each. 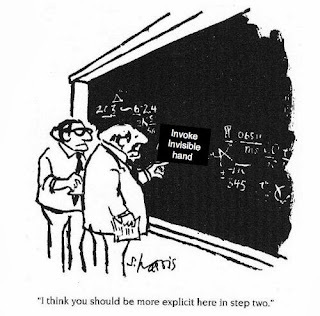 This view is related to any good Bayesian view of the world. You have to look at a base case and compare against the specifics. This is also similar to the shrinkage estimators which look at the long-term average plus the difference between a sample and the long-term average scaled by a shrinkage estimate. Put differently, you are never as good as you think you are on the best of days nor as bad as you think you are on the worst days. Any forecast has to be tempered by long-term averages, You cannot extrapolate from a small set of facts. Some call this mistake the law of small numbers. Temperance in any forecast is a good thing. 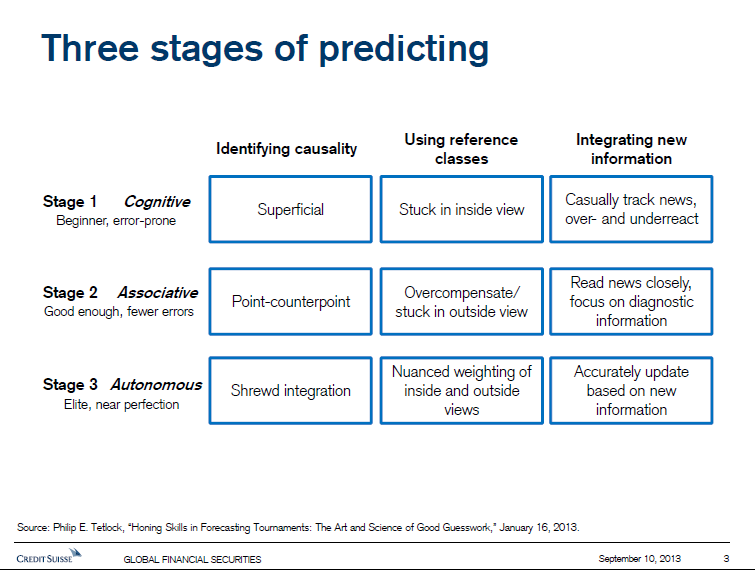 Mauboussin would say there is a difference between luck and skill and you should weight events within this framework. When there is more luck in an event, there will be more mean reversion. If there is more skill, there will less revision to them mean because the actual event is more likely. This paper is 40 years old but still provides strong insights. The economy is complex system and it is hard to control, so we invoke the concept of the invisible hand to explain how this system works. Everyone in the economy works in their self-interest which in aggregate will lead to an efficient allocation of resources, the invisible hand. Since we cannot know how the economy will work in all cases, relying on the invisible hand is necessary. Does that mean there is no place of government or regulation? Of course, not. The issue is whether we believe that we know more about the economy than what is actually the case. We should be humble in front of these complexities and act accordingly. No Summers at Fed - Now what? Larry Summers has withdrawn his name from nomination as the Fed Chairman. I have argued that there would be little difference in policy between him or Janet Yellen. The Fed balance sheet problem would still exist and the dependence on Fed guidance or communication will still be the main focus of policy. Summers would clearly have been more focused on international issue while Yellen would have had a domestic focus. Yellen may be more dovish because of her focus on employment issues. However, the real problem is that monetary policy cannot solve the structural unemeployemnt issues or the growth problem casued by ineffective or inefficient regulation. She is unlikely to force a discussion on these issues. 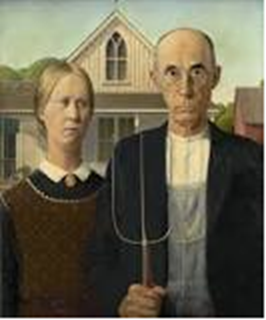 Yellen has a strong history at the Fed and would be a good choice for Fed chairman. Any other choice would create too much uncertainty; however, none of the current policy risks would chnage. There still will be no solution to the blance sheet unwind or tapewr problem and there will still be the issue of what will be the forward guidance as we get close to a turning point. Debt and growth - how do you fund government spending? Simple chart and analysis on Slate concerning debt and growth which has provocative implication. 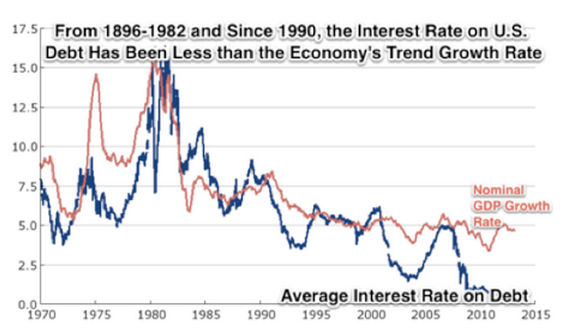 The argument is that interest rates on Treasury have generally been below the growth rate of the US economy. This is good because it suggest that we can potentially grow our way out of debt problems. You can also think about this in terms of the means of financing. In fact, you can think about the marginal dollar spent by the government and the means of financing. The cost of borrowing is less than the marginal dollar of tax taken from the economy if interest rates are below the growth rate. Debt financing in the past has been good. The cost of financing is especially cheap today; however, this is related to Fed action and we are accounting for this gap based on short-term rates. While this is an interesting graph, it should not be the basis for future policy. The risks are too great that the gap could close or reverse. Metaphor may be one of the key reasoning tools which make us human. It is an important tool of logic and communication. It is a catchy use of language to find similarity, but it is also more complex. It allows for abstract thought to be placed in concrete terms. You understand a concept by seeing it or using language to describe the abstract thought with a sense of realism or physicality. We "shed light" on a topic. We "place it under a microscope" for close analysis. It is a form of shorthand for providing insight into our thought process. However metaphor can be used so often that it leads to sloppy thinking. This can be especially true with investment language where there needs to be precision in the likelihood of an event happening. Metaphors are great but may require more guidance in the investment world. There is a reason for the outflows from commodity investing. It has underperformed relative to equities. This is not a simple difference in returns but a significant gap with trends moving in opposite directions for over a year. 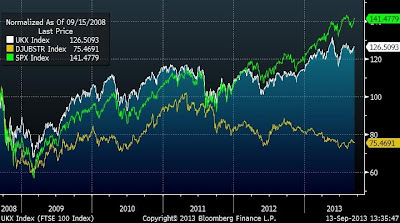 The divergence began in the second half of 2011. Interestingly, the difference really gained after the announcement of Operation Twist in September of 2011 and QE3 which was announced in September 2012. It is odd that commodities have diverged from other risky asset classes. Real rates have until recently stayed negative over this period which is a driver of commodity prices and causes a search or reach for yield. While there are strong reasons for commodities to move lower on the move in real rates and the continued dollar rally, there is no strong reason why there should be this general decline while equities have moved higher. One of the most important mathematicians of the 20th century was Claude Shannon, the inventor of information theory. From radar, to digital signaling, to cryptography, all are based on information theory. Information theory can be explained very simply, information leads to the resolution of uncertainty. This key concept can differentiate trader types. The key to risk management is commitment. Commitment ot a course of action before an event occurs. This is the only way that you can be sure that you will follow a strategy that may be painful, but for your own good. A stop-loss commits to a loss, but may limit what the ultimate lose may be. Stop-loss rules are a key form of commitment to offset the human tendency not to follow through on what may be painful but for our own good. One of the key problems with financial forecasting is that it has low explanatory power. The R-squared of most regressions are very low, less than 10%; consequently, we will not know what are the factors that truly drive returns. We may attribute causality to a news story from the day but that does not mean it is the return driver. 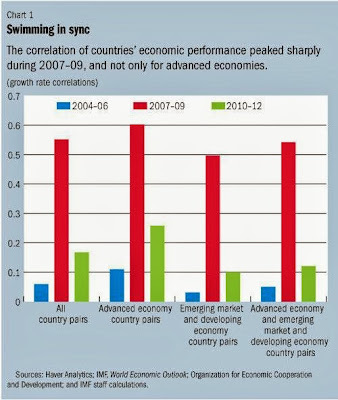 We may falsely see correlation as causality. Beware of the current unknown. Just because the story is simple and easy to tell does not make it right. We would like to make the complex easy to understand but that is not always the case. This is the counter to simple thinking and modeling. We often do not want to do the hard thinking of getting at the root cause of an event. Someone recently asked me about the complexity of the models I use to forecast returns. I think he was looking for some secret answer or complex set of equations. Experience has taught me to keep it simple. It is easier to understand and to fix if something goes wrong. More importantly, it fits within a tradition of science and philosophy. What are EM reserves for? EM central banks have increased reserves over the last decade yet now that some currencies are under attack, governments are using import restrictions and higher interest rates to preserve currency values. Is this a good idea? The thought was to have reserves would be available to offset a sudden stop, a quick reversal of short term capital flows. These has been happening in some of the current account deficit countries. The size of the outflows has not matched 1998 levels, but flows have certainly moved away from the entire EM sector. A good question is what is the purpose of these reserves if they are not used when there is a large depreciation. There have been declines and in the case o f India the data of the size of the decline surprised the market. Still, there is a question of what constitutes a crisis that would call for purchase intervention. Perhaps these reserves are being held back for when there is an increased speculative attack on the currency. What would be those attack conditions? Certainly the central banks are not going to provide the details of what constitutes an attack. It is also possible that these countries are willing to accept some depreciation in order to improve exports. The capital controls are in place to control any excessive outflow. Contain the potential damage. Still, it seems like the focus of EM currency depreciation has been on those countries that were in sad current account positions. It does not seem as though these were currency depreciation by choice. There has been a movement toward structural policy choice tools to adjust capital flows and currency chnages. Less use of reserves and more use of regulation and capital flow controls. This is a result of the research that shows the futility of currency intervention; however, if that is the case, foreign exchange reserves are not needed. A final view is some of the reserve accumulation was not intended but the result of trying to better manage or offset the dollar depreciation desires of the Fed. Much of what we are seeing now is associated with the potential policy changes at the Fed. The Fed eases and the rest of the world has to react. 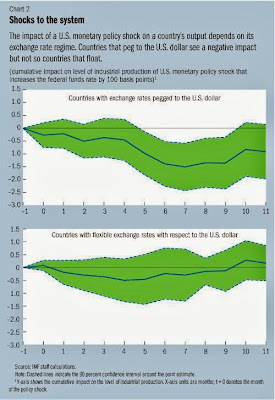 The Fed may tighten and the rest of the world has to adapt. There are different types or variants of uncertainty when describing investor decision-making. According to an old paper by Kahneman and Tversky, Variants of Uncertainty, action must be taken to reduce uncertainty, but we need to understand what kind of uncertainty we are facing. They describe two key types, internal and external. Internal uncertainty could be classified as ignorance while external uncertainty could be classified as disposition of an event. Internal uncertainty or ignorance refers to our inability to know the facts surrounding some event. We can, however, control internal uncertainty. We can get smarter or know the facts. Ignorance should always be minimized. We cannot control external uncertainty. This uncertainty is what will surprise us. Uncertainty has a clear time component. Uncertainty about the past, what actually happened, is a form of ignorance. We can know the past and measure the chance of an event happening. We just may not know the facts. Uncertainty about the future is associated with external uncertainty. We can only project what we may think will happen in the future. External uncertainty can assessed through two ways. A distributional mode based on some distribution or range of chance and a probability, or a singular mode based on an assessed chance of an event happening. When we say that an event is likely to happen with some upper or lower bound, we are being distributional. We declare an amount of uncertainty. When we just say that an event is likely, we are being singular. These are important differences when we want to describe an uncertain event. By focusing on the type of uncertainty faced, investors can reduce or plan for ways to minimize uncertainty and thus better control risk. The focus at the G20 meeting has been on Syria even though that topic was never the intent. It is still not clear what the intent of this G20 summit was supposed to be. We will not see anything meaningful come out of this discussion. and that may be fine. There will be talk about how the developed world must cut back their borrowing excesses but that it must be done in a balanced manner. There will be discussions concerning the tapering of monetary policy and how that should be done gradually. There will be concern about capital outflow in the emerging markets. Some countries will agree that there should be more funds available to stabilize the world. There has been talk of a new BRIC initiated stabilization fund. These funds often do not materialize after the camera lights are dimmed. The overall focus will be on gradualism and concern that growth should be managed and controlled. Jobs should be created, but at the end of the day leaders will get back on their planes and return to their countries and continue the status quo. Businesses will have to get back to the job of trying to turn a profit and find the right mix of labor and capital. Hopefully, they will be able to do this in an environment that is not controlled by policy-makers that want to just find the right mix of fiscal and monetary benefits. This graph is depiction of Antti Petajisto's work from the July/August 2013 FAJ. The author tries to contrast a manager's active share and tracking error versus a benchmark. The active share is half the absolute difference between the actual weight in the portfolio to a set of stocks versus the weight of the stocks in the index. It could be any allocation versus a benchmark weight. For example, it could be the weight in different commodities versus the DJUBS commodity index. The active share is the percentage of a fund's portfolio that differs from a benchmark index. The tracking error is the standard deviation of the difference in return between a fund and its index. You can contrast the active share versus a benchmark and the tracking error of the fund versus the benchmark. If you are an index investor, the active share and tracking error will both be zero. 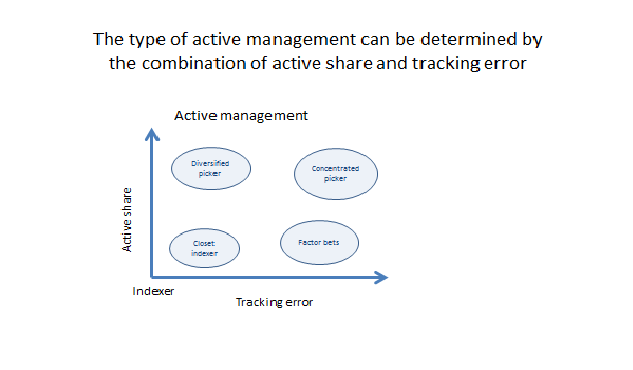 If you are a closet indexer, the active share will be low and tracking error will also be low. A concentrated stock picker will have a high active share and high tracking error. The exposures will be significantly different from the benchmark and returns will also be very different. A diversified stock picker will have a high active share but may not have high tracking error because the diversification may match the index itself. Similarly, a manager who has a high factor bet may have lower active share but high tracking error based on the factor differences versus the benchmark index. 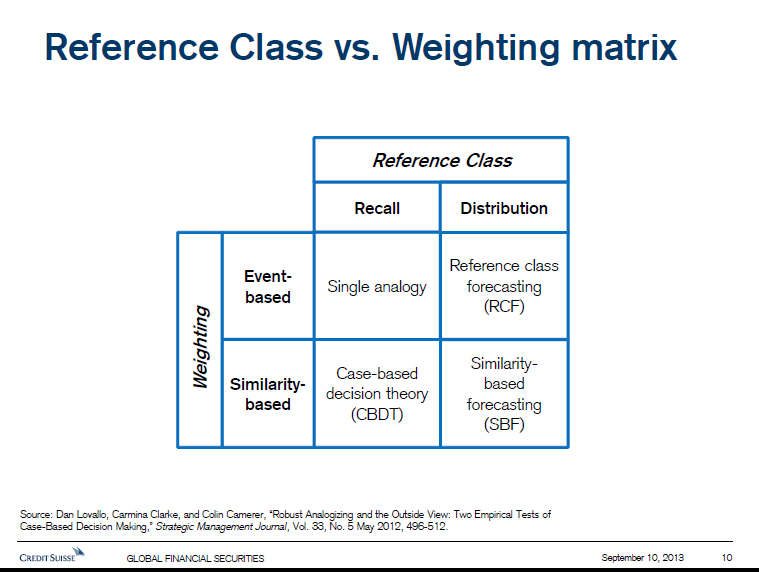 Note that this framework can be used for almost any asset class to show how bets are taken versus some benchmark. It can easily be used to compare hedge funds versus a benchmark to determine whether they may be closet indexers. This is a very useful framework. Markets are governed by doubt rather than conviction, by fear more than forecast, by memories of last time and not foreknowledge of next time. The level of stock prices does not mean that investors know, it means they do not know. Faced with the perplexities and uncertainties of the modern world, market values will fluctuate more widely than will seem reasonable in the light of after-events. This behavior is not the outcome of a wrong-headed propensity. It is the inevitable results of an investment market organized along the lines described. For it is not sensible to pay 25 for an investment of which you believe the prospective yield to justify a value of 30, if you believe that the market will value it at 20 three months hence. As time goes on, I get more and more convinced that the right method in investment is to put fairly large sums into enterprises which one thinks one knows something about and in the management of which one thoroughly believes. Niall Ferguson has written a provocative short book on what he calls The Great Degeneration. It is an institutional economics argument for economic development or in the case of the US, economic decline. He believes that the the great divergence between Western and Eastern economic development has now moved not just to a significant convergence in growth but reversal of fortune for the West. The degeneration of Western structures and the acceptance of some key structures by the East will lead to further convergence of income and wealth levels. There have been a growing number of works on the Great Convergence of income levels and there has been a new focus in history on the development of the East and West over the last few years. The conclusion of many as embodied in the great book Why Nations Fail is that institutional structures matter. Niall Ferguson wants to provide his take form the view of a historian with an economic focus. Ferguson focuses on four black boxes which drive Western civilization: democracy, capitalism, the rule of law, and civil society. These help form the institutions we live in. Institutions are like the hive that bees live in. They determine whether there is limited or open access for individuals to thrive or be successful. Institutions determine whether the government is extractive or inclusive. Ferguson starts with the foundational observations by Adam Smith that stagnation occurs when an economy is in stationary state and this state is a function of the institutional arrangement of the economy. A really good set of institutions for growth are hard to achieve, so an economy has to be careful with how institutional arrangements develop and change. The economic structure and society is a contract or partnership between citizens. If the governed allow for bad laws and incentives change, behavior of economic players will also change. This can place an economy in a stationary state which will not allow opportunities for growth. Democracy determines the inclusiveness of citizens and creates the opportunity for limits on government. Capitalism is needed to allow for failure and the taking of chances for new opportunities. The rule of law allows for a system of justice, and a civil society creates an environment of trust. If these key drivers of Western civilization are changed, it will have impact on the potential for economic growth. Politics determine institutions which drive growth. Long-term growth is more about incentives and structures than it is about fiscal and monetary policy. Fiscal and monetary policy will fail if the institutions for growth fail. We will be in a slow growth economy, the stationary state, if we allow our institutions to degenerate. American Exceptionalism - does it exist? Charles Murray of the Cato Institute just loves to be controversial and his latest book American Exceptionalism is true to form. There has been a lot of talk about American exceptionalism with the emphasis placed on America being extraordinary and special. America as above other countries. Murray argues differently. He believes America is exceptional as defined by uniqueness. America was an experiment in government which was foreign and different from what had been tried and what was expected. The focus is not that America is better but it has been unique and if the factors that drove this uniqueness change, America will no longer be exceptional. This work is consistent with the view that economic development is driven by institutions and institutions are driven by the behavior of individuals. 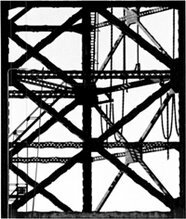 Institutional structure matters for growth and if there is a convergence in institutional structures there will be a convergence of growth. So what made America exceptional (unique)? It was the first country to translate ideology of individual liberty in a governing creed and restricted the power of government to control people. It was unheard of to have a leader like George Washington step down from power. The experiment worked and thrived. European viewed America as exceptional. It was Stalin who used the term American exceptionalism. The rest of the world viewed America as someplace different. Outside observers declared that America was unlike any other nation. It was a fact in the past and not something that you could believe in. The issue is whether America will be exceptional going forward. The future of exceptionalism is based on the behavior of the populace. 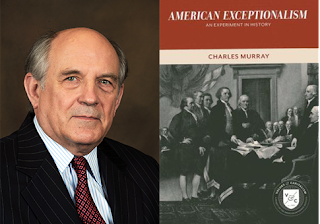 Murray argues that focus on individual liberty with a government controlled by the governed is based in practice on its civic culture. The American civic culture was unique because of its four special traits, industriousness, egalitarianism, religiosity, and the combination of philanthropy and volunteerism. If these traits diminish or change, there will be a loss in American exceptionalism and it will become more like other countries. Industriousness is the assumption that getting ahead is a function of hard work and making a better life for oneself and your family. The long work hours in America is the empirical manifestation of industriousness. The trait was also represented by economic independence. The falling work force participation is the signal that this characteristic is in decline. Eglaitariansim as defined by the traditional view is the absence of class. Most Americans always viewed themselves as middle class even those who were in upper income levels. There is not an aristocracy in the US; however, education and wealth differences may be showing this to be in decline. Religiosity is the importance Americans place on religion. There has never been a state religion so joining a religion was an expression of individuality. There is no counterpart in Europe where there are state religions. It served as a moral foundation for government and behavior in America. Currently, levels of church attendance is declining and religion is playing a lesser role on social behavior. Community life is the final factor which makes America unique. America has been a country of volunteers for both charity and local government. America is a country of joiners. This neighborliness was a substitute for government. We have seen a decline in volunteerism in the country, so again the level of exceptionalism versus other countries is in decline. There has been a high degree of social trust. When we look at how citizens interact with government and with the overall community, we are seeing dramatic change from past behavior. It is unclear whether exceptionalism will be a characteristics of America in the future. Claudio Erb and Campbell Harvey in their paper "The Gold Dilemma", published in the 2013 July/Aug Financial Analysts Journal, analyzed all of the reasons for holding gold and conclude that you would be hard pressed to find one that stands up to empirical review. Makes you wonder what all the fuss about gold has been over the last few years. The real price of gold can have significant changes, and there is a positive momentum effect, but the fundamental arguments do not hold together. Gold is not an inflation hedge. There is not a strong link with either actual inflation or unanticipated inflation. There is a positive correlation, but real price of gold as measured by the gold price to CPI ratio is very volatile. The price of gold is driven by real changes and not the inflation rate. It is the real price of gold that has been the main driver of gold volatility over the last 30 years. The real price of gold also shows strong mean reversion. High real gold prices will see subsequent real returns that are negative. 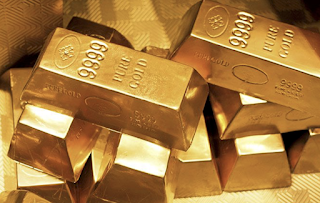 There is a link between fiat money and gold but when compared with other monetary regimes, it is less clear what the link between a monetary regime and gold prices will be. Gold is not a currency hedge. Gold and currencies have the right correlation for a hedge, but regression analysis shows there is little explanatory power between the two. Again, the real price of gold dominates any currency relationship. Gold as an alternative to assets with low real rates. There is a negative relationship between the real yield on TIPS and the real price of gold, but the line of causality is not clear. 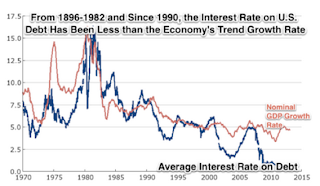 A time trend can better predict real gold prices than real yields. Gold as a safe haven. Simply put, there is not a strong relationship between gold returns being high when stock returns are low. Gold does not seems to have the characteristics of a safe haven. Gold does not have high returns when there is hyperinflation. Gold is not a substitute money. Given the fluctuations in the real price are not associated with monetary regime or inflation, the gold as money argument does not seem to work. Gold is under owned argument. Investment demand for gold increases when the price rises. The allocation in a global portfolio seems to be currently consistent with a diversified portfolio. The correlation with equities and bonds has fluctuated from negative to positive values, so the allocation that should be held in a diversified portfolio will fluctuate. However, there could be an argument that gold is under invested by some central banks which could lead to higher prices. There just has been too much emphasis on holding gold for reasons that cannot be supported without selected analysis of the data. You can hold gold if the real price is low as an asset that will mean revert, but the other arguments are misplaced. There may be some under investing in emerging markets, but the other key arguments are harder to justify.